Wild-caught Alaska Pollock with lemon, peppercorn and panko breadcrumbs. 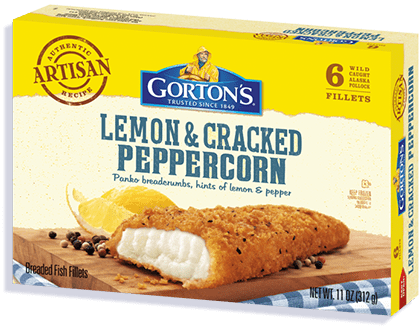 Real ingredients like cracked peppercorn, zesty lemon and panko breadcrumbs bring out big, bold tastes and crunchy textures, turning any meal into a gourmet affair. And at just 150 calories per fillet, fancy flavors have never been more healthy. ALASKA POLLOCK, VEGETABLE OIL (COTTONSEED AND/OR SOYBEAN), WATER, ENRICHED BLEACHED WHEAT FLOUR (FLOUR, NIACIN, IRON, THIAMIN MONONITRATE, RIBOFLAVIN, FOLIC ACID), MODIFIED CORN STARCH, LESS THAN 2% OF: YELLOW CORN FLOUR, SUGAR, SALT, CORN SYRUP SOLIDS, BUTTER (CREAM, SALT), SPICES, YEAST, WHEY, BAKING POWDER (BAKING SODA, SODIUM ALUMINUM PHOSPHATE), DEHYDRATED ROASTED GARLIC, BLACK PEPPER, HYDROXYPROPYL METHYLCELLULOSE, CONCENTRATED LEMON JUICE, WHEAT FLOUR, NONFAT MILK, MALTODEXTRIN, COLORED WITH PAPRIKA, ANNATTO, AND TURMERIC EXTRACTS, CITRIC ACID, NATURAL FLAVOR, DEXTROSE, CARAMEL COLOR, MALIC ACID, PARSLEY, SODIUM TRIPOLYPHOSPHATE (TO RETAIN FISH MOISTURE), TBHQ (TO PROTECT FLAVOR).